When a Link Monster’s effect is activated that targets this face-up card on the field (Quick Effect): You can destroy this card, then send 1 Spell/Trap on the field to the GY. During the End Phase, if this card is in the GY because it was destroyed on the field by battle or card effect and sent there this turn: You can Special Summon 1 “Rokket” monster from your Deck, except “Autorokket Dragon”. You can only use each effect of “Autorokket Dragon” once per turn. Autorokket Dragon is next to the launch pad. 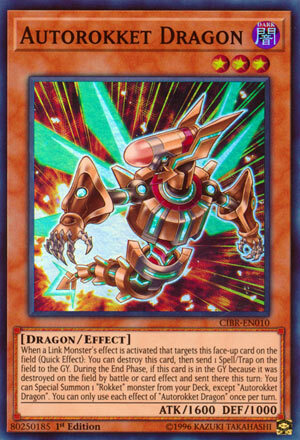 This dragon machine hybrid monster is a 1-for-1 initially on spell/trap destruction when a Link Monster targets it. Then you get a different Rokket in the End Phase from the deck, thinning it and replacing your resource, netting yourself a +1. I like this more than yesterdays card, as you get immediate results for your trade of a Rokket monster rather than just a one-time disruption. Pendulum Scales, Field Spell cards, and face-down cards that have been sitting on the field from the previous/current turn are all worthy trades for “losing” your Rokket. Monster effect negation is great, but that’s what we’ve got Breakthrough Skill, Skill Drain, Solemn Strike, and Effect Veiler for. No one runs MST hardly anymore (sadly), in favor of their own archetype spell/trap destruction, and destruction is always preferred versus letting an opponents card survive to live another day. Next up on Rokket Week is Autorokket Dragon. Autorokket Dragon is a Level 3 DARK Dragon with 1600 ATK and 1000 DEF, which are your average stats on a Level 3. When a Link Monster targets Autorokket Dragon (Quick Effect), you can destroy this card to send a Spell/Trap on the field to the GY. Non-targeting and non-destruction is a great trait, since most effects of Spells/Traps when sent to the grave are triggered by destruction. Autorokket Dragon can get rid of a potentially devastating Spell/Trap your opponent controls that could of really hurt your chances of winning a duel. MST, Twin Twisters, Cosmic Cyclone, etc. are all really good cards because getting rid of Spells and Traps is very good, there isn’t really much to say about that. Autorokket also has that Rokket Effect the rest of them have, cause I would hope it does. Autorokket is a staple in the Rokket deck, the card is pretty good. Art: 4/5 They look cool, but they aren’t very inspiring artworks. Autorokket Dragon isn’t quite as powerful as the Monster we looked at yesterday, but he can at least be used for attacking, which I suppose balances out a lower effect (in my opinion). Still a Dark, Dragon Monster, Level 3 as opposed to 4, with 1600 attack (which isn’t terrible, actually good for a Level 3) and 1000 defense. Here, we see we get a destruction effect instead of a neutralizing/negation. As said yesterday, the first effect on Rokkets is triggered when a Link effect is activated that targets this card (while face-up) on the Field. Autorokket then sacrifices itself and allows you to destroy a Magic or Trap card on the Field. There certainly are better and easier ways to destroy a Magic or Trap card, but it’s still a welcome ability in the theme, and still will get you a new Rokket via Special Summon from your Deck at the End Phase. It is worth mentioning the Magic or Trap card you destroy doesn’t have to belong to your opponent. No stipulation as to that, so if there’s something of your own you want or need to destroy, you are welcome to do so, and I appreciate versatility in my effects. I like this guy has a reasonably decent attack body, even with a slightly weaker overall effect. Art: 4/5 Still a nice picture, but I like the green on the Rokket better yesterday, and I like the red/blue in the space background as opposed to here. Autorokket Dragon continues Rokket week with a Level 3 Dark Dragon-type monster with 1600 Atk and 1000 Def. The stats are pretty good for a Level 3 Dragon. Any deck you can run Allure in gets a point. The effects are good too. As usual, the Quick Effect triggers when a Link Monster’s effect activated that targets a face up Autorokket Dragon. It destroys itself and lets you send any Spell or Trap from the field to the grave. Then, during the End Phase, you get to replace the destroyed Autorokket with any other rokket monster from the deck via Special Summon. Each effect of Autorokket is once per turn which isn’t perfect, but it doesn’t matter how Autorokket is destroyed and it is great during either player’s turn. Backrow is still played, and this doesn’t specify face up or face down for the Spell or Trap it removes. Definitely worthy in the deck. Score: 3.75/5 Art: 4/5 Cheeky artwork and names are funny.